What is a solar-powered outdoor security light? Solar powered outdoor security lights convert solar power into electric energy to provide lighting without using electricity. They are charged by the sun, so you won’t need to worry about power cords getting in the way. They are ideal for use around steps, driveways, porches, patios, walkways, carports, and sheds. The durable Sunforce LED Solar Motion Light automatically turns on when it detects motion. The amorphous solar panel generates electricity in all daylight conditions, even on cloudy days, so you can get reliable lighting anytime. The weatherproof light comes equipped with 60 super-bright white LED lights and three adjustable settings: light level, time, and sensitivity. This has easy installation and is maintenance free. It includes a lithium-ion rechargeable battery and mounting hardware. It has outstanding online reviews, including more than 2,000 five-star reviews on Amazon. The Sunforce 80-LED Solar Motion Light is another highly reviewed option from the brand. 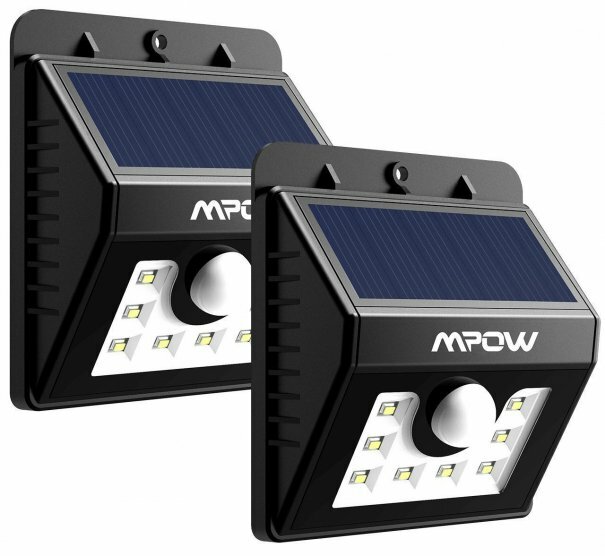 Amazon’s #1 best-seller in commercial emergency light fixtures, the Mpow Solar Lights, turn on automatically in the dusk and turn off at dawn. They offer fast charging, seven hours of illumination, eight ultrabright LED lights, and long sensor length. They also feature three intelligent adjustable modes: strong long light mode, dim light sensor mode, and strong light sensor mode. A polysilicon solar panel shortens the charging time, even in less sunny environments. This set has outstanding online reviews, including more than 2,000 five-star reviews on Amazon. Amazon’s #1 best-seller in patio ceiling light fixtures, the durable wireless URPOWER LED Outdoor Solar Motion Sensor Lights have large solar panels, a large capacity battery, 20 LEDs, and a diamond lampshade. The waterproof, rustproof, high temperature-resistant stainless steel construction can withstand years of rain, snow, ice, and wind. Thanks to intelligent detection, brighter light activates when sensing motion, and the light stays on for 20 seconds after motion stops. 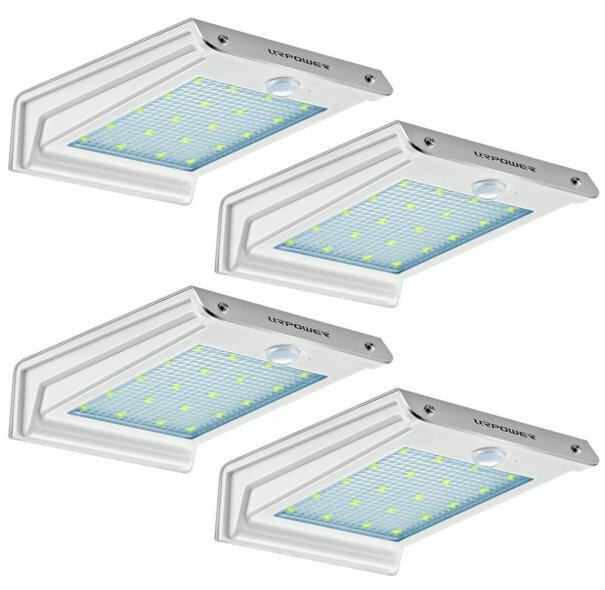 It’s easy to install this four-pack with the included mounting hardware and lights can be positioned seven feet away from each other to cover a larger area. This includes a 1000mAh 3.7V Li-ion rechargeable battery for up to 10 hours of use on a full charge. It has outstanding online reviews, including more than 1,000 five-star reviews on Amazon. 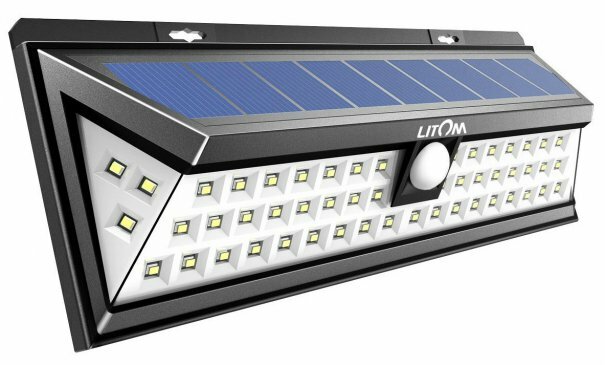 Amazon’s #1 best-seller in island lights, the Litom Super Bright Solar Lights offers a broad range of bright light. The unique design has a wider 120-degree sensor angle and longer sensing distance. The durable weatherproof light has 54 super bright LEDs and a built-in PIR motion sensor. The larger solar panel has faster battery charging (even in cloudy environments) and more power energy storage. This automatically turns on when it senses motion and has three adjustable lighting modes: medium light mode, dim light sensor mode, and sensor mode. Installation is easy with the included mounting hardware. The light is frequently recommended online for those who want a bright outdoor light. 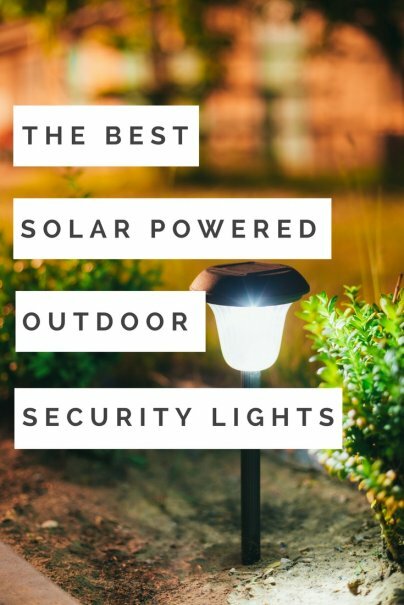 The durable MAXSA Innovations Motion-Activated Dual Head LED Security Spotlight is one of the brightest solar-powered, motion-activated outdoor security lights on the market, thanks to four super-bright LEDs. It can withstand any weather and turns on automatically when motion is detected. It is fully adjustable thanks to three dials for time, motion sensor range, and amount of darkness needed for activation. The amorphous solar panel can efficiently charge, even on cloudy days, ensuring you get light when you need it. 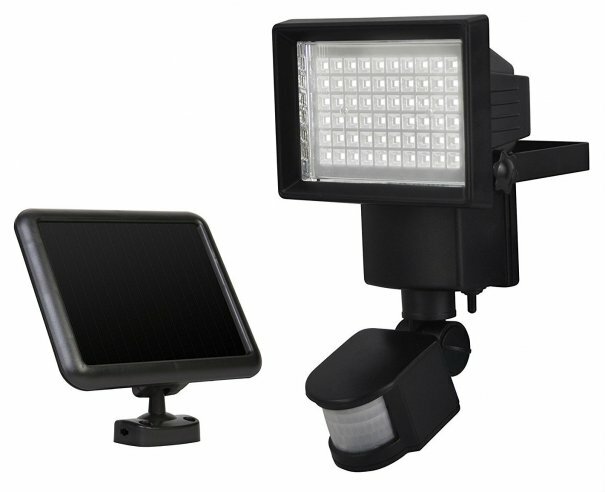 The solar security light has two heads that can be pointed in different directions for wide illumination. Installation is easy with the included mounting hardware. This also includes three 1.2V NIMH AA rechargeable batteries that last up to three years. 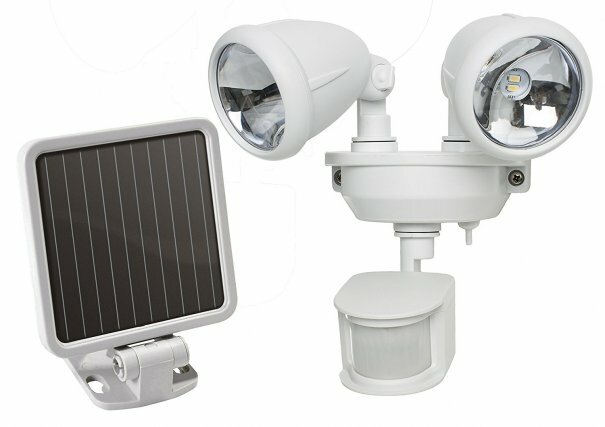 And those are our recommendations for the best solar powered outdoor security lights. As always, be sure to check Wise Bread's Buying Calendar to learn when and how to buy just about anything!